This Hot Wheels Speedy Pérez was released as part of the 2017 Legends of Speed Series. Variations: NO – my research indicates that there are currently no known variants of this series/model. If you are looking for information regarding Hot Wheels variations please check out the books and guides we use as reference. Specialty: With an ion propulsion system, upgraded air splitters and super smooth lines, this futuristic racer is inspired by Sergio ‘Checo’ Pérez – a champion ahead of his time who’ll dominate the track for years to come. This model featured the first use of the Ryu Asada 6-Spoke (RA6) wheel type. 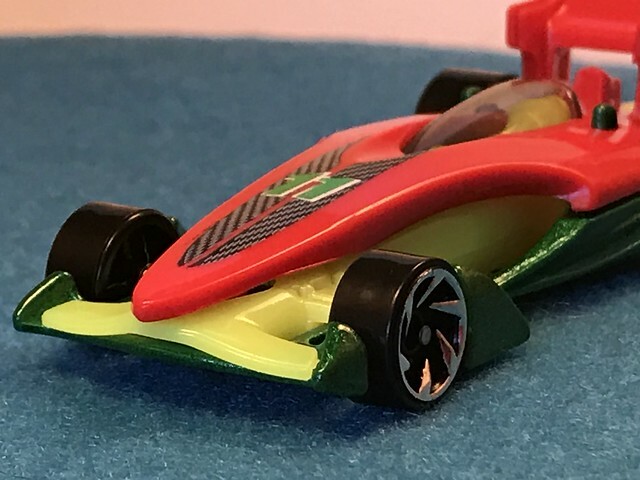 This article uses material from the “Speedy Pérez” article at Hot Wheels wiki at Fandom and is licensed under the Creative Commons Attribution-Share Alike License.